When you need to communicate with people outside your organization, such as partners, vendors, customers, or other external contacts, you can have an administrator add these people to the organization's address book as shared contacts. Note: You must have administrative permissions to add shared contacts. Log in to the Microsoft Exchange Admin Center, with your Office 365 email address and password. In the contacts list, click the plus sign button, and click Mail contact. In the new mail contact dialog box, enter the information about the shared contact, and click Save. In the contacts list, click the new contact, and then click the pencil button. 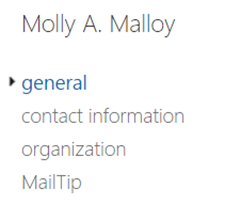 In the new contact profile, click each header (i.e., contact information, organization, MailTip) to add more information about the contact. At the bottom of each each header dialog box, click Save. To add a shared contact to a distribution list, see Change or delete a distribution group. For more information about distribution groups, see What is a distribution group?